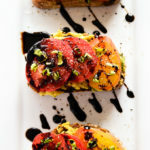 This avocado + heirloom tomato toast with balsamic drizzle showcases late summer’s finest garden produce. Hearty bread is slathered with olive oil, toasted, and topped with cream avocado, juicy heirloom tomatoes, and fresh basil. 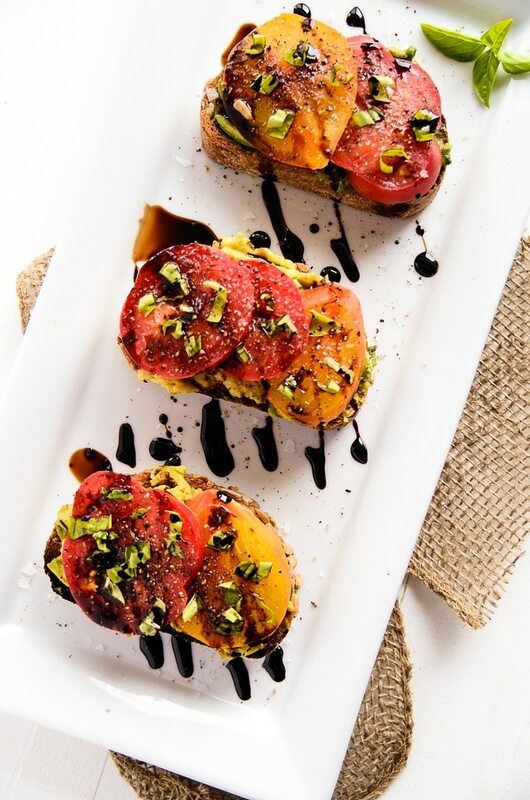 Balsamic reduction is gently drizzled over top, and the pretty little toasts are then flecked with sea salt and black pepper. They say that you should always eat your frogs first. 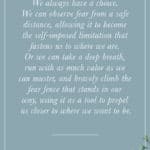 I first heard about this concept about seven years ago, and it’s stuck with me ever since. If you haven’t heard this motivational phrase before, don’t worry. 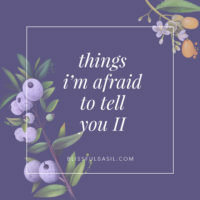 No one’s recommending you actually eat frogs, just that you prioritize the things you want to do least (i.e., icky frogs) and get them done first, because eating your frogs first makes every other task on your to-do list seem like a piece of cake. My frogs come in all shapes and sizes, and they often go by the names of Laundry, Unloading the Dishwasher, Writing Long Psychological Reports, and Opening Paper Mail. Sometimes, like right now, I add Getting a Haircut to my list of frogs. I have three theories on the haircut frog: 1) being vegan has made me a bit hippie-ish, 2) I’m just plain aloof and forgetful or 3) I’m going through some sort of delayed quarter-life crisis in which I’ve equated long hair with youth. I’ve learned that when I let tasks linger over my head for hours, days, or even weeks, they slowly chip away at my soul. Slightly dramatic but seriously, they really weigh on me! On the other hand, when I complete those tasks first in my day or week, I immediately feel empowered, motivated, and ready to take on all of the “cake” tasks. 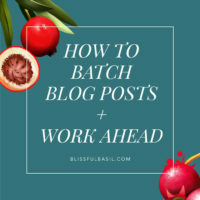 I usually don’t have blog frogs (ha); however, I’ve had one hanging over my head for months. 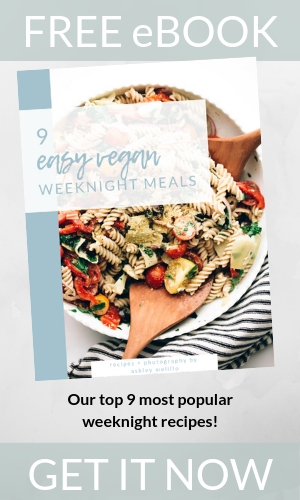 Many of you have been kindly requesting a better Recipes Page, specifically, one that is organized visually rather than with a mile-long list of hard-to-read links. Although I completely, 100% agreed from the moment someone first pointed it out, I dawdled on the task for-e-ver because making one is pretty time consuming. I finally ate that frog! In case you missed last night’s blog update post, from here on out, you can sort through the original Recipes Page OR you can search through the Visual Recipe Index. The Visual Recipe Index is categorized (e.g., Breakfast, Smoothies, Salads, Vegan, Vegetarian) and when you click on a photo it directs you to the visual index for that particular category. It took about 10 hours (and a few choice words) to complete, but it was so worth the effort. Even if you don’t want to use the visual index for sorting through recipes, take a gander simply for the sake of witnessing the rapid decline of my photography skills as you scroll down the reverse-chronologically-ordered pages. I’m half embarrassed and half proud that the perfectionist in me hasn’t gone back to at least re-shoot the photos I took with a Blackberry… and in the middle of the night, it seems. Forgive me for burning your eyeballs with those knockouts. Now onto more important, non-froggy, and super delicious things like Avocado + Heirloom Tomato Toast with Balsamic Reduction Drizzle. Anything with the word “reduction” in it automatically sounds fussy and impractical to me, but I promise you that this recipe is as simple as they come. That whole balsamic reducing part only takes about 15 minutes and the rest of the recipe can be made while the fussiness is occurring on your stove. 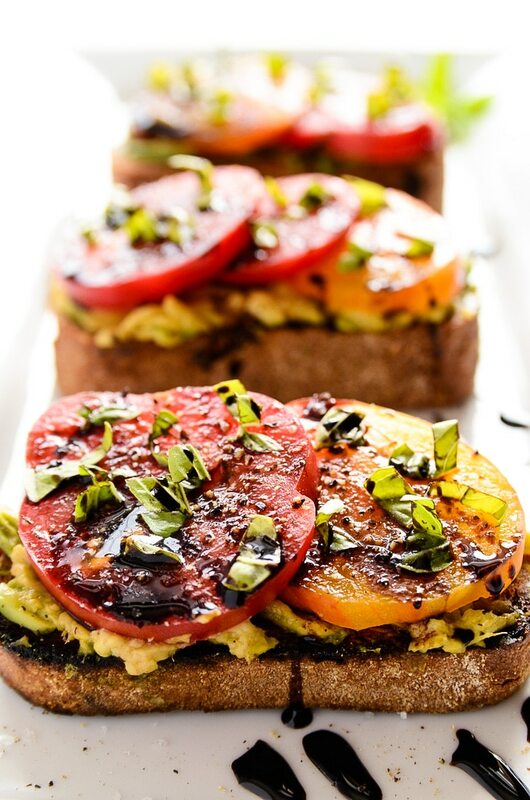 Hearty bread is slathered with olive oil, toasted, and topped with smashed avocado, heirloom tomatoes, and fresh basil. 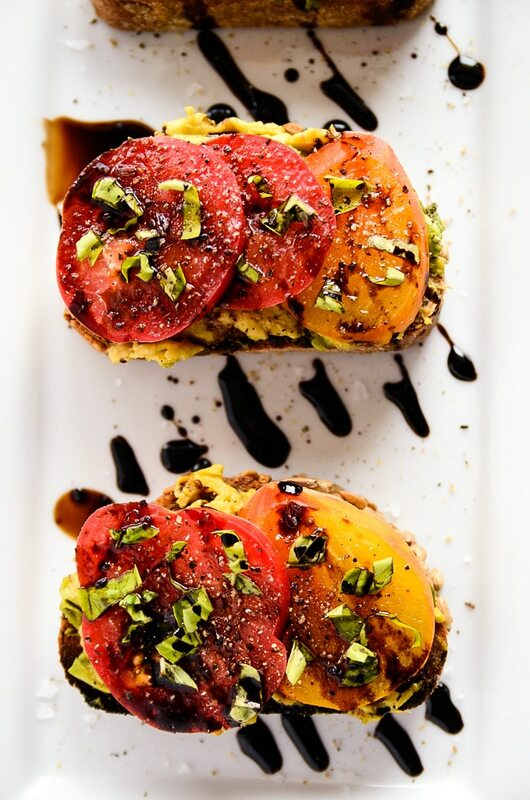 Balsamic reduction is gently drizzled over top and the pretty little toasts are then flecked with sea salt and black pepper. 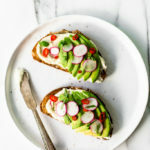 This is my favorite dish to showcase how flavorful tomatoes can be when they’re at their peak during the summer months, and who can resist another avocado toast rendition? Not me. I’m a complete fool for avocado toast, and I can easily eat it 5-7 times a week. No joke. I might have actually exceeded my maximum last week. 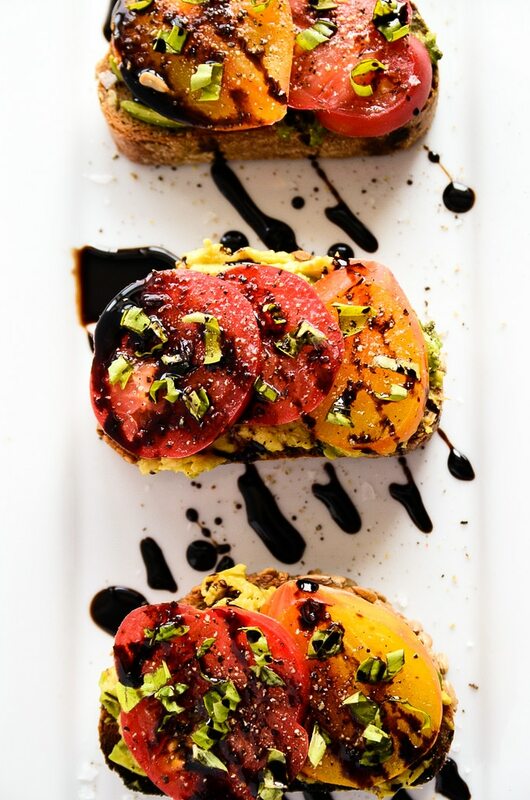 This avocado + heirloom tomato toast with balsamic drizzle showcases late summer's finest garden produce. Hearty bread is slathered with olive oil, toasted, and topped with cream avocado, juicy heirloom tomatoes, and fresh basil. Balsamic reduction is gently drizzled over top, and the pretty little toasts are then flecked with sea salt and black pepper. Evenly divide the avocado between the pieces of toast and use the back of a fork to smash the avocado. 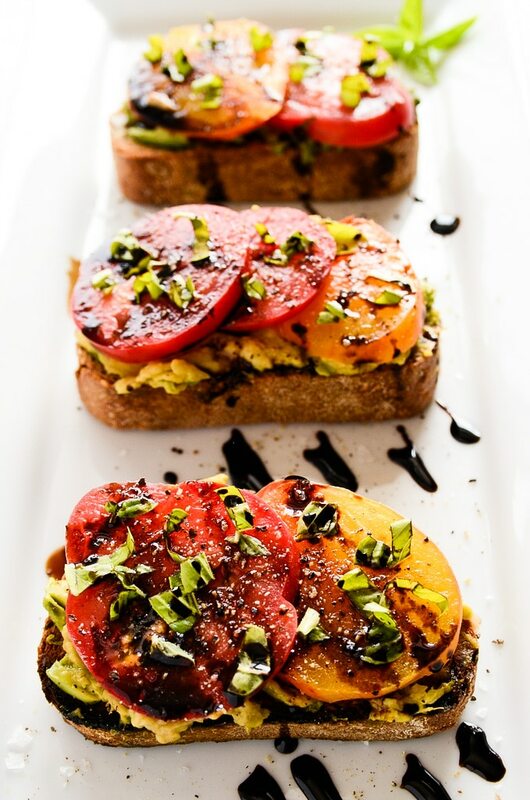 Layer the sliced tomatoes on top of the avocado, sprinkle with fresh basil, and drizzle with the balsamic reduction. Haha! Thanks, Meredith! They’re a cinch to make and so tasty. I hope you have a chance to make them! ok totally cant wait for ure next recipaaay! 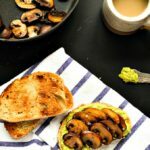 love coming across new toast topping ideas.. these look seriously delicious! definitely inspired to top my toasts with heirloom tomatoes now! Thanks, Thalia! 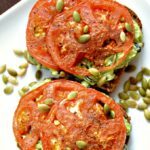 You have to try heirloom tomatoes on avocado toast; they make the entire thing so flavorful and savory! 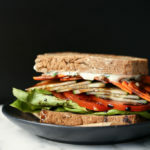 I went through a phase last summer when I ate a sandwich like this for lunch every day… But mine never looked so beautiful! Looove that balsamic drizzle in your pictures! Looks simply delicious Ashley! 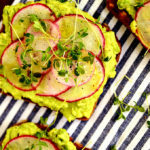 Avocado toast is quite the thing nowadays and for good reason! Simple, healthy and delicious! 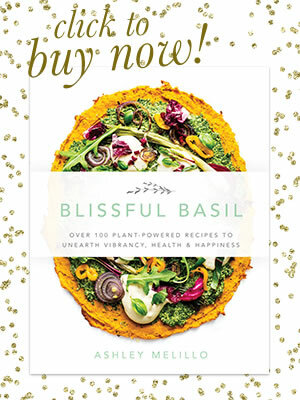 This is very enticing….can’t wait to make it. Love the frog theory! I love the recipe and really sympathise with the haircut issue. I have a problem with it because I have curly hair and 90% of the haircuts I get are awful so it always causes extreme stress. So I guess you could say that haircuts are definitely one is my frogs! Im super excited about this recipe because I love caprese salad and gave really been missing it since I went vegan last fall. Thank you for sharing!!! Hi Alicia! 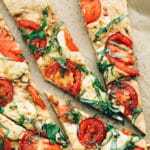 I didn’t even think about how similar the flavors are to a caprese salad! Great comparison :) I hope you enjoy the recipe! These look so yummy and really anything with balsamic vinegar has to be amazing. Thanks for the recipe. Im really in love with the recipes. Curious to how the balsamic drizzle would be if not used right away? I would love to be able to bring this to lunch for work with each item in a separate container. Do you think the drizzle would maintain its integrity if made the night before and used the following day? Hi Tiffany! The balsamic reduction keeps well for weeks in the fridge, so it’s totally fine to make ahead and drizzle later! Enjoy!!! This had become my favorite lunch. I love the texture , the taste, the look. It is so creamy and delicious. And healthy too.The best, thank you. Ashley..Ashley..Ashley!!! OMGOSHHH!!! SOOOO incredibly YUMMM!!! Thank you, thank you for this amazing recipe! LOVED it!!!!! Yea!!! It was THAT great! I am sooo happy I found it! Because I have to be gluten free; I made it on an Against the Grain bagette, that I cut into thirds. SOOO YUM!! These look amazing and super easy to make! I love using a really thick balsamic too with fresh tomatoes! Mmmmmmm can’t wait to try this, once my heirloom tomatoes are ripe! Thank you!